Cool things this week include Arrival, Burden of Dreams, Foreign Correspondent, Bob Dylan, and Blow Out. It was a good week for movies in the Brewster house. I watched a couple of things I’ve been wanting to see for a long while and a couple of others I didn’t know I wanted to see until I sat down and watched them. There was a good comic book, too, and some really good music. I’ll hash it down to five cool things so let's get to it. Ever since I heard there was an alien-invasion movie whose hero was a linguist (played by the always wonderful Amy Adams), I knew this was a movie I wanted to see. Or rather, as I wrote when I picked Arrival a few weeks ago, it was a movie I knew my wife wanted to see. But I’m always in for creeping-looking aliens. But due to various circumstances, I never saw it in the theater and I just got around to catching it at home. I really liked it. I love that the protagonist in a big budget sci-fi adventure is a female linguist suffering from intense grief. I loved its visual style, its incredible score, and its use of smarts instead of violence to solve its crisis. There were moments in the middle where I wish they would have slowed down just a little instead of skipping quickly past how they were able to further and further understand the alien language. Jeremy Renner’s character could have been fleshed out a bit more, but mostly it's a great little intellectual, arty film. I’ve never seen a Werner Herzog film but his reputation as both a brilliant filmmaker and a rather bizarre and oftentimes unhinged personality keeps him on the list of director’s whose films I need to check out. Burden of Dreams is not a Herzog movie but a documentary by Les Blank about the making of Herzog’s Fitzcarraldo. That film was notoriously difficult to make. About halfway through filming it, Jason Robards, the main star, became ill with dysentery and was forced by his doctors to bow out. At the same time, co-star Mick Jagger had to leave due to commitments with the Rolling Stones. The film was then recast with Klaus Kinski and production was essentially reset. Because Herzog can’t do anything the easy way, he set his film in the deep Amazonian jungle where his production came up against supply problems, disease, crew revolts, and even attacks by local natives. Yet for nearly four years Herzog pressed on and eventually made the film he wanted. Burden of Dreams is a fascinating document on a troubled production and how its enigmatic director endures ruthless hardships to pursue his own dreams. I’ve been collecting unofficially released live concert recordings for close to twenty years now. For most of that time, I’ve more or less avoided audience recordings (like it sounds, "audience recordings" are when a member of the audience brings in their own microphones and records the concert from their own seats - as opposed to soundboard recordings where someone tapes the show plugged directly into the soundboard). Audience tapes are full of crowd noise and depending on the tapers location and the venue they often sound like someone’s playing music from two doors down. Why bother with less than stellar audience tapes when there are plenty of soundboard recordings that sound professionally made? Bob Dylan has actually turned my feelings on this subject around. Though soundboard recordings do exist of his concerts they are pretty few and far between. Over the last few years, as I’ve gotten more and more into Dylan I’ve learned to accept the inherent flaws in audience recordings and enjoy the music. Shows like this one go a long way into making that really easy. This particular bootlegs comes from a company called Crystal Cat and they tend to send in two or three different people with microphones who sit at different sections of the venue. They then blend the recordings together which gives the overall music a fuller sounds and allows them to reduce the audience noise. You could easily think that this show was a soundboard recording it sounds so good. The performance is outstanding as well. The year 2000 is one of my favorite years for Dylan. His set lists combined a nice mix of his classic hits, deep cuts, interesting covers, and a few songs off his at the time recent (and still excellent) album Time Out Of Mind. His band is running on all cylinders and Bob’s voice is in fine form. Its a great show all around and the sound just knocks me out. You can download a copy of the show, for free, right here. With so many choices now available through streaming sites, I often find myself spending half an evening just browsing through all the selections. Often, I’ll eventually land on something that wasn’t even in my radar. So it was with this 1981 film from Brian De Palma starring John Travolta. I’d heard of it before but nothing about it made me want to rush out and give it a watch. Yet one night this week there I was pressing play because, well, why not? Turns out it's really rather good. Travolta plays a guy who does sound effects for low-budget horror movies. One night, while out at a park recording nature sounds, he inadvertently records a car having a blow out and careening into a river. Turns out the driver of the car was Governor McRyan. He died in the crash but girl who was definitely not his wife is rescued by Travolta. After listening to his recordings Travolta’s character is convinced that the tire was intentionally shot out by an assassin and the governor was murdered. From there De Palma spins a fascinating thriller worthy of his obvious influence, Alfred Hitchock. 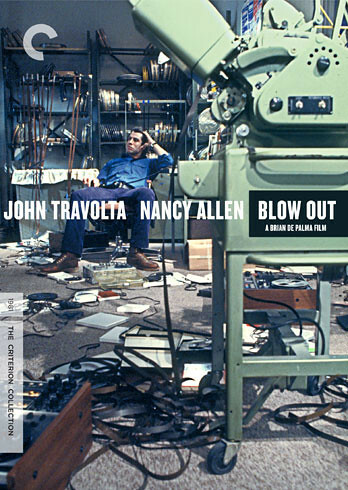 For more information on the film you can read our review of the Criterion Collection's release. Speaking of the Master of Suspense, I quickly followed up Blow Out with Hitchcock’s spy thriller starring Joel McCrea, Laraine Day, and a delightful George Sanders. Though it was his second film to be made after the director came to Hollywood, it is mostly set in London (his first American film, Rebecca was also set in England so I guess old Hitch just wasn’t ready to make truly American movies yet). Foreign Correspondent sends Joel McCrea’s journalist to Europe on the heels of World War II. He plays a series of deadly cat-and-mouse games with a group of spies who are set on sending England hurtling into war with Germany. It's got all of Hitchock’s usual bags of tricks, including some exciting action sequences, a love interest who may or may not be all that she seems, and plenty of suspenseful set pieces. The story itself is lesser Hitchock but his visual style is right there amongst his best films. The best sequence takes place on a plane. The scene starts out with the camera floating outside the plane and then slowly it zooms in on a window where we see the action taking place inside and then the camera seemingly moves through the window and takes us right inside the plane. It's a sequence common in more modern movies where you can easily create the effect with computer effects but for a film made in 1940 its pretty astonishing. After a few minutes of conversations inside the plane, it is shot down by a Germany boat and crashes into the ocean. The crash and the subsequent rescue from a sinking plane is some of the most exciting moments Hitchcock ever put on film. Chris Cornell has one of the greatest voices in rock. As a long-haired, flannel-wearing, alt-rock kid in the '90s, Soundgarden was my jam. Though my musical tastes moved away from what Cornell was doing as a solo artist and with Audiosoave, any time one of his songs came on I always stopped what I was doing and turned it up. He died Thursday of an apparent suicide. It is a great loss to music, and deeply saddens me. If you are feeling suicidal, please the National Suicide Prevention Hotline at 1-800-273-8255. They can help.